I am at the National Restaurant Association Show in Chicago this weekend, and today I will be watching my daughter Kristina on the main cooking stage demonstrating her “Tunisian Lamb Burger with Harissa Mayonnaise and Orange-Olive-Date Relish.” Last year, the National Restaurant Association (the other “NRA”) named Kristina their “Hot Chef of 2009.” She will be passing on her title today to the newest hot chef of 2010. Her burger won a contest sponsored by the Australian Lamb Board, and her prize is a trip to Australia this September. 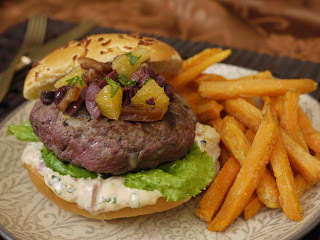 Here is her winning burger and recipe! 1. For Burgers: In a small, dry pan, toast the cumin and coriander seeds over medium-low heat until they are toasted and fragrant, about 2 minutes. Stir in the Shraz and honey. Bring to a boil over high heat and boil hard for 1 minute; stir in the turmeric and cinnamon. Set aside to cool slightly. Crumble the lamb into a large bowl. Add the red onion, garlic, black pepper, and spice-wine mixture. Knead together lightly, but thoroughly to distribute ingredients. Form into 6 patties, about 6 ounces each. Place on a baking pan, cover with plastic, and refrigerate at least 30 minutes, or as long as overnight. 2. Meanwhile, prepare the mayonnaise and relish. For mayonnaise, whisk together all mayonnaise ingredients in a small bowl. Cover and refrigerate until ready to use. For relish, combine all relish ingredients in a small bowl. Cover and refrigerate until ready to use. 3. When ready to cook, heat a skillet or grill pan over medium-high heat until very hot, or build a medium-hot fire in a barbecue grill. Season burgers on both sides with sea salt. Brush a little olive oil on grill pan or outdoor grill. Cook the burgers in the skillet, turning once, for 7-10 minutes for medium-rare; or grill outdoors, if desired. While burgers are cooking, toast the buns in a toaster oven or under the broiler until lightly toasted; or toast them on the outer perimeter of the grill rack outdoors. When the burgers are done, remove to a warm platter and let rest for several minutes while dressing the buns. 4. To build the burgers, place a bottom onion bun on work surface. Spread with some of the harissa mayonnaise, top with red lettuce leaves, burger, some of the relish, then bun top, also spread with some of the mayonnaise. Repeat with remaining burgers. Serve burgers with sweet potato fries. Makes 6 burgers.